We’ve talked about the lax standards and regulations of American cosmetics. Now it’s time to talk about what we can do to protect ourselves. A first step is awareness, because it’s easy to expose yourself to harmful chemicals when you assume all products are safe. Next, make a decision to change. For more than twenty years, I loved experimenting with all kinds of makeup. I remember getting makeup tips from my aunts when I was a child and slathering my Barbie makeup all over my face. Now I shudder to think about the makeup’s ingredients. When I was officially allowed to start wearing makeup at age 13, I jumped in with everything – foundation, blush, eye shadow, powder, lip liner, lip gloss, and fingernail polish. I wore these every day. For years. And underneath it all were layers and layers of perfume … perfumed lotion, perfumed talcum powder, and body spray. We’re talking Love’s Baby Soft and Debbie Gibson’s Electric Youth. (Does anyone else remember those fragrances?) Later I upgraded to eyeliner, mascara and lipstick, not to mention hair gel, mousse, permanents, highlights and hair dye. As soon as I learned about the toxicity of these products – after 20 years of use – I stopped using nail polish and hair dye. Later, as a stay-at-home mom, I realized I didn’t need foundation, perfume, or half a dozen hair styling products, so I quit using them. In detoxifying my makeup collection, it was helpful for me to throw away all of my harmful products. Believe me – I’m a cheapskate, so it was hard to see things I bought with my hard-earned money heaped in a trashcan. But once the products were out of my house, I wasn’t tempted to use them anymore. When warm weather hit, I couldn’t give in to polishing my toenails because the polish was long gone. Once you’re aware of the potential harm caused by personal care products, shop with a discerning eye. Unfortunately, there’s no easy way to choose safe products – doing an online check is most effective. Visit the Environmental Working Group’s helpful Skin Deep Cosmetics Safety Database to research acceptable products. After checking the Cosmetics Safety Database, buy accordingly. The database ranks products by their toxicity levels; while some products are fairly harmless, others have a moderate or even high hazard level. Thanks to these rankings, I’m able to find toothpastes, mascaras, eyeliners, and soaps at my usual discount store and not have to go out of my way to shop for safe products. 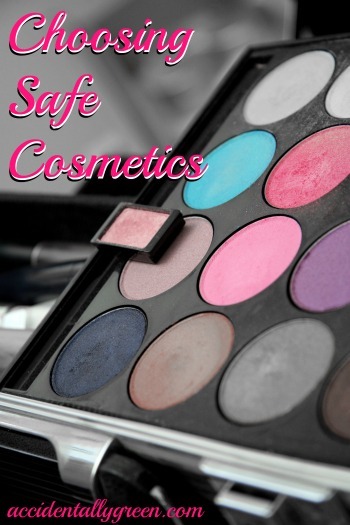 Safe cosmetics also can be found online. Many brands of mineral makeup are completely safe. Again, researching the products before buying is essential. Shopping for safe personal care products does require a lot of research and time. I think that’s more than American consumers should have to do. But it’s a fact of life right now. To try to change matters, it’s important to make your opinion known. Contact cosmetic companies to complain about their harmful ingredients. I’m not a fan of big government, but talk to your U.S. representatives to request stricter legislation. For me, I know I should spend more time alone with the Lord in prayer, worship, study, or simply resting in Him. Yet daily I fall into the same trap of spending more time physically getting ready than with my Creator. Once you watch out for toxic cosmetics and keep a proper, godly perspective of your appearance, then let your beauty shine. One affordable and healthy way is to make your own personal care products. Unfortunately, I’ve never made any of my own. But I would love to hear any of your recipes. Please share your tried and true homemade beauty treatments! Do you know if there are any safe nail polishes? And what do you know of name brand cosmetics? You may want to check out nail polishes at my post, http://accidentallygreen.com/potent-polish/. It explains a lot more, and also links with the Cosmetic Safety Database’s nail polish page. There actually are safe nail polishes! And name brand cosmetics are hit or miss. Some are fine, others are pretty dangerous. I’ve found that the Cosmetics Safety Database is the only way to make sure. Hope that helps! I was just reading a book the other day about the time of Queen Elizabeth. Did you know that the fashion then was a makeup called Ceruse which was a white paint for the face that contained significant amounts of lead. Women were getting sick, losing feeling in their fingers, skin turning grey, losing mental acuity, having stillborn children and many miscarriages and still they wore this unnatural makeup. Some speculate that that Queen Elizabeth died of lead poisoning. So isn’t amazing that in some ways we are doing the same things to our body now! Great post! That is really fascinating, Cara! I wonder if any women of Queen Elizabeth’s time ever figured out that their quest of “beauty” was their demise?